What It’s About: Best known for his historical epics (including Ran and Seven Samurai), Akira Kurosawa started his career with some gripping detective films. 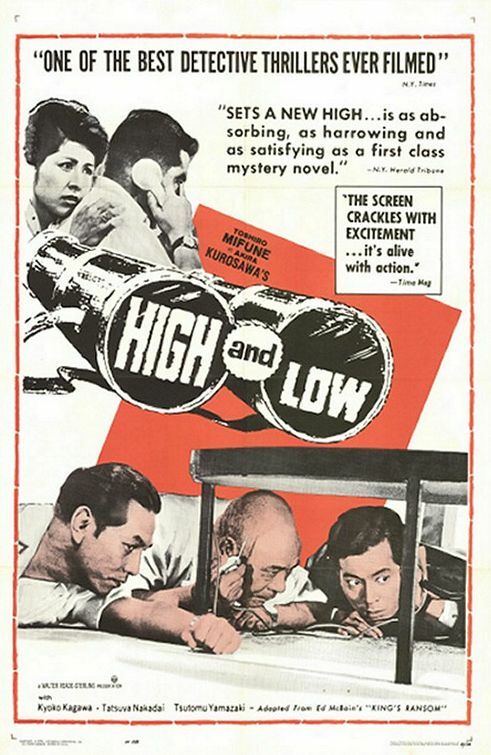 In High and Low, adapted from the novel King’s Ransom by Ed McBain, Toshiro Mifune’s wealthy shoe baron must make a choice between keeping control of his business and saving the kidnapped son of his employee. The film weaves together his personal struggle with the exertions of the detectives and the tragedy of the kidnapper to craft a finely balanced thriller. Why Watch it Today? : December 7 marks the anniversary of the bombing of Pearl Harbor by Japanese forces in World War II. One of the effects of World War II on Hollywood cinema was to cast Germans and Japanese people as convenient villains for decades to come (think Dr. Zin in Jonny Quest). On the other side of the Pacific, though, Japanese filmmakers adapted Western film genres and reimagined them in Japanese contexts. The resultant products, from Godzilla to Kurosawa, have in turn been hugely influential on Hollywood. This entry was posted in Action, Adaptation, Addicition, Based on a Book, Black and White, Crime, Detective, Drama, Film Noir, Hostage Situation, Movie of the Day, Mystery, Stalker, Thriller, Tragedy and tagged Akira Kurosawa, class issues, detective, Ed McBain, heroin, industrialist, Japan, kidnapping, mistaken identity, noir, ransom, rock and roll, shoes, Sixties, Toshiro Mifune.